Every little girl dreams of being a princess. Or at least the cartoonized versions of fairy tale's favorite girls. In Nick Luckenbaugh’s Royal Fables, the inner truths of some infamous and some not so well known princesses are given the song cycle treatment through a story of love, power, and triumph. With a predominately folk rock score, Royal Fables journeys through what lies underneath the masks of some of our favorite storybook princesses. The set up is simple. Scheherazade, a young woman of "One Thousand and One Nights" fame, avoids murder by telling her new husband, the king, a series of stories. These stories are of young girls like herself: fairy tale princesses. 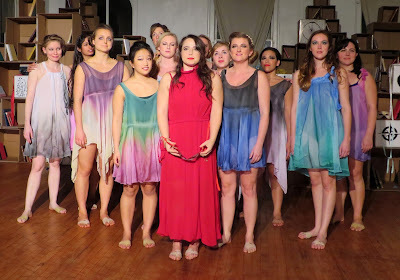 Royal Fables is a song cycle that champions strong women and their true tales. With the set up being story after story, each princess gets a solo and her time to shine. But it’s the moments of unity that offered some of the most beautiful and triumphant pictures. The piece longed for more moments where the ensemble appeared together as “The Night Goes On” and "Worlds End" were some of the most exquisite and captivating moments. "Worlds End" may be Luckenbaugh's strongest number in the show. It most definitely is Royal Fables' "Seasons of Love." What Luckenbaugh does well is he identifies key words and themes that make the individual princess memorable and recognizable and creates inspiring numbers without coming off kitschy. Some of the songs live wonderfully in their world but could also serve as standalone pieces outside Royal Fables. To no fault of their own, the band overpowered some of the softer voices, but as a whole, the entire ensemble of Royal Fables was quite spectacular. Some of the standout performances came from Catherine Ang as Sleeping Beauty, Hayley Biegel as Rose Red, Theresa Burns as Repunzel, Madeline Fansler as Twelfth Dancing Princess, Kristin Kelleher as the Traveling Princess, Lizzy Palmer as Cinderella and Elyssa Renee Ramirez as The Princess Who Wanted to Solve Riddles. The pure voiced Livie Casto as Scheharazade deserves special recognition as the eyes into this world, rarely leaving the stage and remaining actively captivating. With such stunning material to work with director Megan Mekjian struggled to deliver it to its full potential. With virtually a blank canvas to paint, Mekjian only touched upon the where this piece could go offering something a bit bland. One of the most confusing parts of the piece started as the audience walked in. The intent of the pre-show reading time did not read properly. While some actresses were reading in character, others were conversing out of character which truly muddied the intent. It was especially ruined when one of the orchestra members walked through and high fived each actress. When implementing a pre-show bit, it truly needs to serve the piece and Mekjian did not succeed. If the intent was to showcase that princess and actress are one in the same, it did not appear within the actual production. The scenic design by committee created a childlike imaginary world with cardboard bookshelves interspersed with iconic images established each princess. Mekjian did succeed by having Scheharazade place each princess’ mask on their icon throughout allowing the audience to understand who was who a little better. The lighting design by Michelle Tobias was a colorful explosion of life. The only issue was Tobias and Mekhian needed to make a stronger and definitive choice for audience applause. Without a shift in light, an audience is unsure whether to clap or allow the action to continue. The costumes by Travis Alexandra Boatright worked wonders for the piece however they longed for a little more personal identification. Sure, breaking free from the stereotypes of the popular culture versions of the characters may have been the ultimate goal, simply by having stronger color choices via mainstream iconography would have been helpful to instantly identify the princesses. Writer Nick Luckenbaugh is fortunate to have such a strong piece on his hands. Royal Fables just begs for future life. His songs will be sung by young girls for years to come. But to reach its full potential, Royal Fables may need to find a new theatrical vision.